A friend of mine described the cookies served at her school: so fresh from the oven they were literally falling apart. In a good way? Yes, but only if you don't mind walking around school with chocolate smeared lips and a stained blazer. I took the photographs for this post in the morning. As you can see, I dunked a cookie in (vegan) milk for one of the shots. I couldn’t put it back in the tin, of course, so had it for breakfast (tough life). 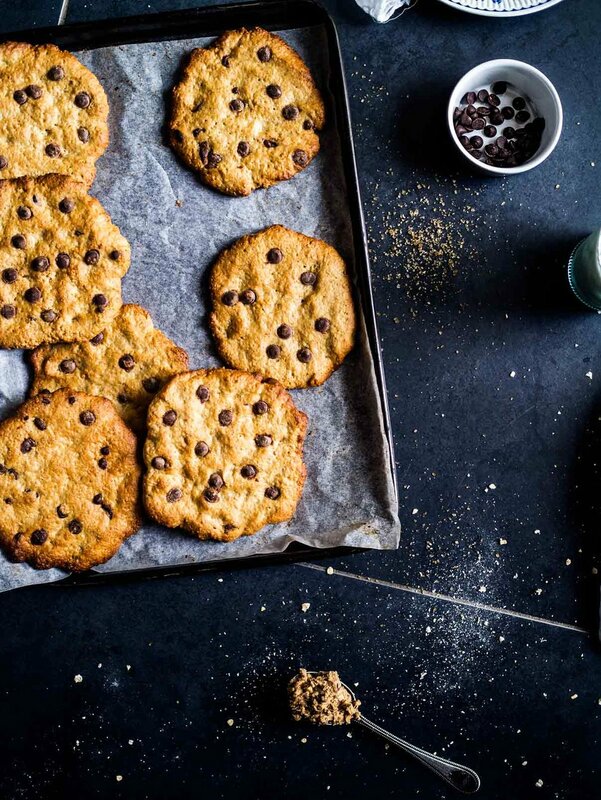 It reminded me of staying at a friend's as a child, and being all of shocked, jealous and ecstatic to be greeted by cookies and milk in the morning. Such unknown pleasures all before noon! It dawned on me in later years that this was a special treat for me and my friend. Growing up ruins everything. Well, some things anyway. I confess that this recipe was intended to be cookies and (vegan) milk, just like I remembered. Unfortunately, only the cookies made the cut: I experimented with making rice and hemp milk but it just wasn't right. I've deferred the experiment. Can't win 'em all. Anyway, this left me with more time to focus on the cookies themselves. Friends have occasionally glanced at my Instagram or website and remarked something like "ooh, healthy". I must emphasise that this has never been a particular aim or focus. I put recipes on my blog that inspire me, or that I think people will find helpful, or that I just love to eat myself. Perhaps the comments stayed with me because the confusion between veganism and 'clean' eating is a pet peeve of mine. Indeed, I have vegan friends whose diet consists primarily of Oreos, crisps and pot noodles. 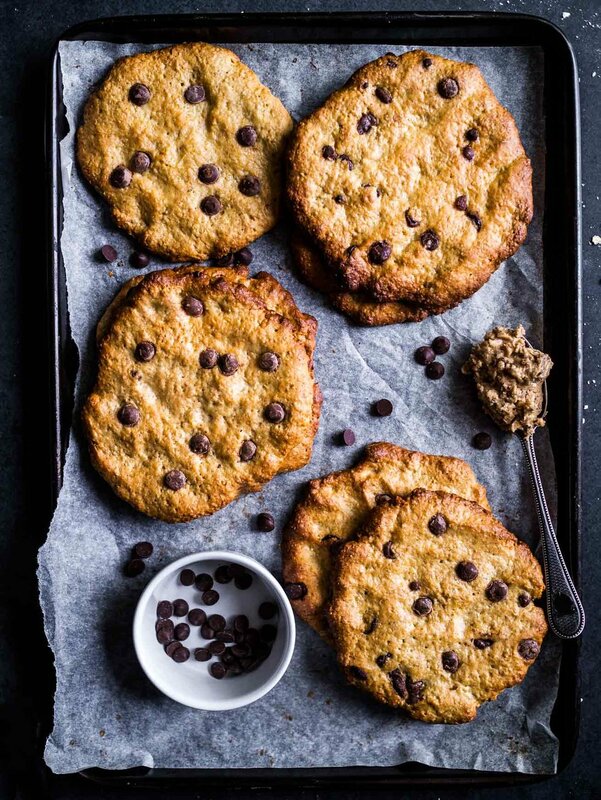 So I thought now would be a good time, at least in my head, to redress the balance with these delicious, luxurious, indulgent, rich, sweet, vegan peanut butter choc-chip cookies. I tested a variety of binding agents: ground flax seeds, bananas and dates. Ground flax seeds won out because they don’t add any new flavours to compete with the pure chocolate and nut combination. 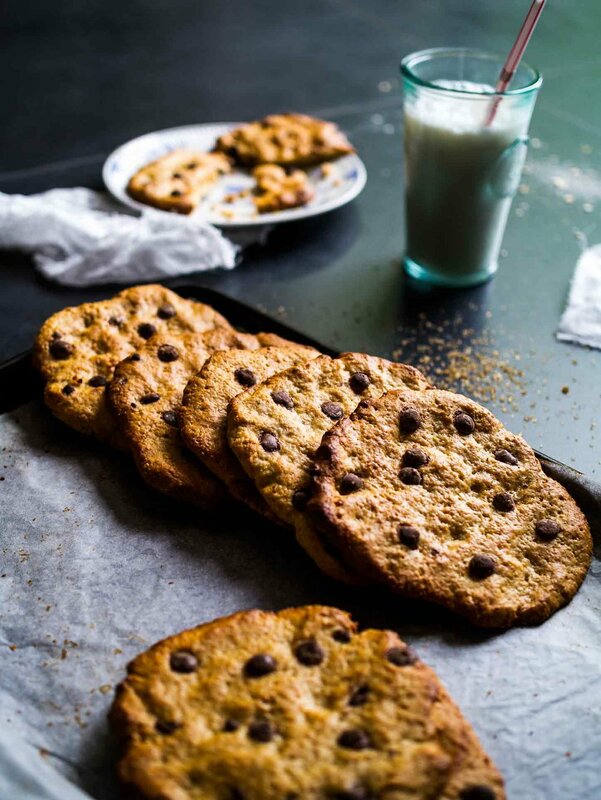 Pleasingly, though, the banana and dates both worked to bind the cookies, so if you'd rather keep the ingredients list simple, take a look at the optional substitutions list below the recipe. *if you're using unsweetened, unsalted peanut butter, add an extra ⅛ tsp sugar and ⅛ tsp salt. Mix the ground flax seeds with 5 tbsp (75ml) water in a large mixing bowl. Set aside for 15 minutes until it has a gel-like consistency. Put the oats, flour, sugar and salt in a food processor and blitz for about 15 seconds. Mix the peanut butter and plant-based milk into the flax-seed gel as well as you can with a fork. Add this to the food processor and pulse until combined into a sticky ball. Avoid over-mixing. Line 2 large or 3 medium baking trays with baking parchment and scoop out the mixture into the large mixing bowl from before. 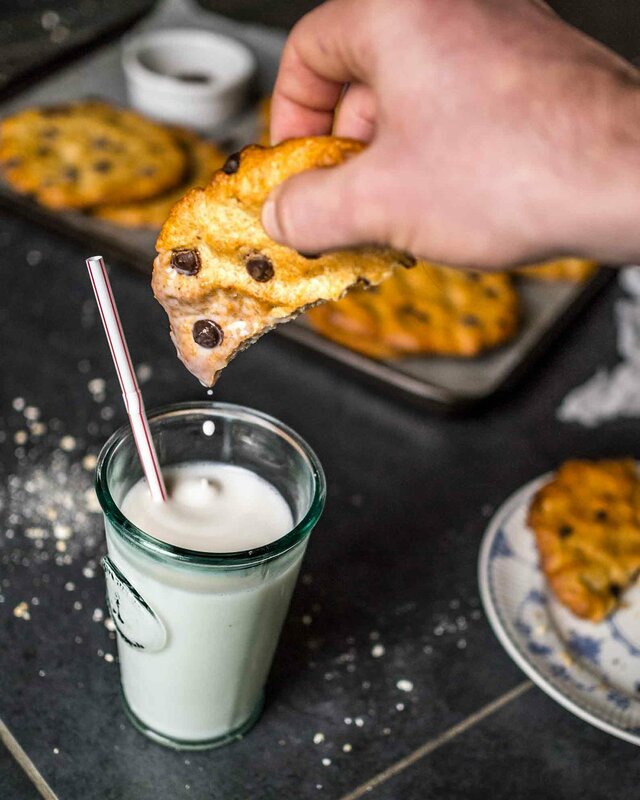 Wet your hands, or use a damp spatula or spoon, and mix half of the chocolate chips into the cookie mixture. To shape the cookies, fill a small bowl with water and set it next to the baking trays. Periodically wet your hands so the mixture doesn't stick to them. Weigh out 50g/1.75oz pieces of cookie mixture and space them out evenly on the baking trays. You should have 12-14 cookies. Flatten into a cookie shape with the flats of your fingers to about 1cm/½ inch. Push the remaining chocolate chips into the surface of the cookies. Bake for 15 minutes, rotating and swapping the trays round after 10 to make sure they bake evenly. It's likely they will need 5 more minutes, or in some ovens 10 more; just bake until nicely browned but not overdone. Err on the side of underbaked rather than overbaked. Leave to cool on the trays for 10 minutes, then carefully transfer to a wired rack to cool completely. Store in an airtight container. flax seeds 1 large ripe banana. Add more banana if mixture not holding together. 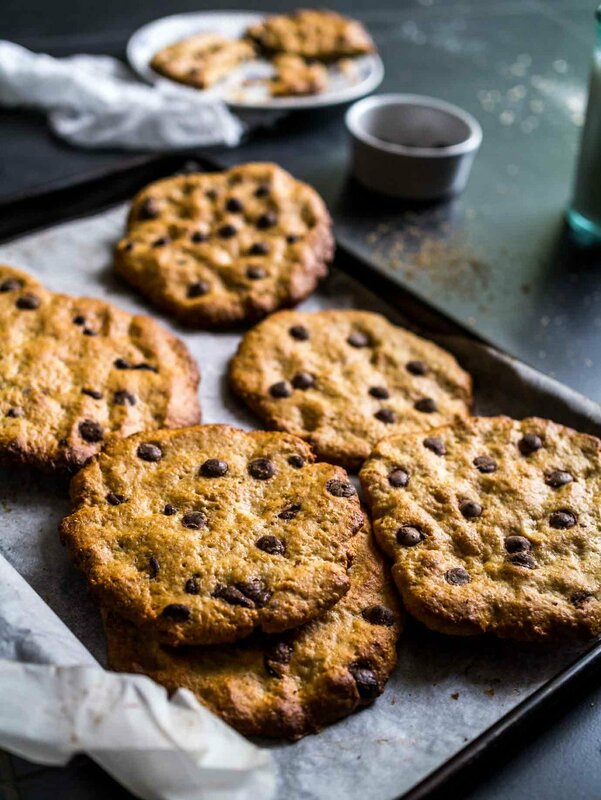 These soft and gooey Peanut butter + Chocolate Chip Cookies are soft, indulgent, easy to make and 100% vegan! No obscure ingredients either.